My KMD innovator’s seminar. Very special guest – amazing and cool media artist Daito Manabe will give an talk about his amazing works. I hope the students can pick up how to be so creative. He is a technologist who has the ability to create radical new interfaces with humans and computers. 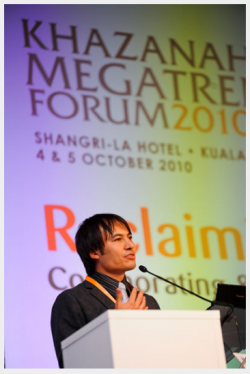 ARE2012: Adrian Cheok Keynote from locative media on Vimeo. Keynote talk at ARE2012 – Augmented Reality Event 2012. Adrian David Cheok. “Augmented Reality for All Senses”. Santa Clara. ARE 2012, the world’s largest augmented reality event, invites you – The People – to discover the wonders of augmented reality (AR). Register today with the Early Bird Discount and save $100 before it expires on March 21st. For the first time, ARE 2012 is reaching out beyond the tech world – to everybody out there – who is seeking to leverage AR to advance their business or their life. The event will kick off with keynotes by Frank Cooper (CMO of Pepsi), and Miles Ludwig (VP Digital at Sesame) – that will showcase how mainstream corporations are using AR as a key tool to drive customer engagement in consumer packaged goods, as well as education and entertainment. Adrian Cheok (Professor at Keio University, Tokyo) keynote will blow your minds by demonstrating how AR can go beyond the visual sense and leverage all our senses. Can’t have a true AR event without “The Prophet of AR”; Bruce Sterling will come back this year to share his insights about the evolution of the AR industry, and have a fireside chat with special guest Daniel Suarez (best selling author of techno-thrillers Damon and Freedom) – about the far reaching opportunities with AR, and its looming dangers. The AR Market and successful business models with Maarten Lens-FitzGerald (Layar) – on how to generate revenue with Augmented Reality, and Matthew Szymczyk (Zugara) – about where we are in the AR Commerce Hype Cycle. AR for Marketing and Branding– a panel moderated by Gene Becker showcasing best practices from leaders who implemented some of the most successful AR campaigns to date. AR for eCommerce and Retail – including talks by Bruno Uzzan (CEO, Total Immersion) and Andrea Carignano (CEO, seac02) about real revenue-making products in this market. AR For Wellness with Adam Odessky (HelloDocPal) about current use of AR for healthcare, and HealthCare Alert – an app tracking health alerts in real time with augmented reality. AR Games as always will be a big draw featuring speakers from the most successful AR games companies: Brian Selzer (Ogmento), Josh Shabtai(Vertigore), and more. AR For Cars – a session dedicated to the automotive industry led by Juliana Clegg from MVS California creator of the CableGuide HUD with participation from major car companies, and analysts in this space. User Experiences in AR with one of the world’s top experts in AR user interfaces – Mark Billinghurst (HIT Labs NZ), and additional world experts in UX for AR. As in every year, the leading players in AR Eyewear will be back to excite us about the prospects of AR in your field of view, and update us on how long we need to wait for it and what we can do to accelerate it. For the techies, a hole track of sessions will drill into the state of the art in AR Technologies. Mobile AR Technologies with Marc Gardeya (Dekko) which will talk about Hybrid Tracking, David Murphy (Nokia) – about Nokia’s Mirror world browser, Ben Blachnitzsky (Metaio) – about Object Tracking, Martin Lechner (Wikitude) about SDK for AR browsers, and Hafez Rouzati (Georgia Tech) about their standard-based Argon browser. Christine Perey (Perey Consulting) will lead a panel discussing Interoperability and Open AR Content and experiences. Dr. Thomas Alt, founder and CEO of metaio will discuss the process of building a delivery stack that ensures reliable, accessible AR from chipset platform to end-user. And speaking of hardware for AR, Stephane Gervais-Ducouret (Freescale) will speak about efficient hardware for AR, Mike Housholder (InvenSense) about motion interface for immersive mobile AR experiences, and Neil Trevett (VP at Nvidia and President of the Khronos Group) about emerging hardware for AR. Steven Feiner, Professor of Computer Science at Columbia University, will share his experience in implementing AR for more than 20 years. If you go by Churchill’s old quote: “The farther back you can look, the farther forward you are likely to see”, Professor Feiner is the most qualified to speak about the future of AR. ARE will also feature a bunch of thought provoking talks about AR Game changers such as Amber Case (Geoloqi) and Brian Mullins‘ (CEO, Daqri): AR at the Center of the New Polis: Sociopolitical Impact & Opportunities. This was just a sneak preview. Stay tuned for many more speakers and fascinating sessions about how to turn around your business – with Augmented Reality. Hope to see you there! If you are coming please “ping” me on twitter @adriancheok. 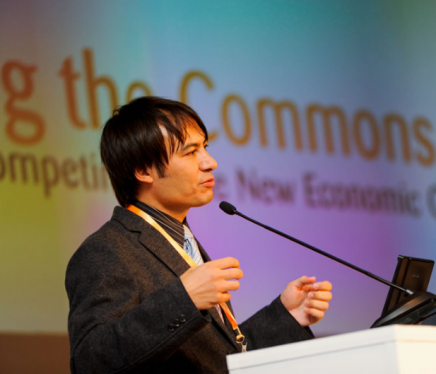 Augmented Reality Event – ARE 2012 1st Keynote Speaker Announced: Adrian David Cheok Inventor of “Krazy” Augmented Reality! Synopsis: We have entered a new era of humanity. For the first time we have constant 24/7 real time global communication. How has this changed humanity and the internet generation? How will learning change. What are the mega trends we will see from this digital exponential revolution. Lift Asia: Embodied Media and Mixed Reality for Social and Physical Interactive Communication. Adrian David Cheok describes his recent and intriguing projects about mixed reality and networked objects, some of them focusing on human-animal interaction. He show new facilities within human media spaces supporting embodied interaction between humans, animals, and computation both socially and physically, with the aim of novel interactive communication and entertainment. For the Seoul Digital Forum 2012 which will occur in May 2012, I was asked some questions about the topics of the conference. The questions and my answers are below. 1. What does ‘coexistence’ mean to you in this digital era? developments in every aspect of human lives in the form of new kinds of symbioses between humans and computers, new ways of communication between people, and new forms of social organization and interaction. Thus hyperconnectivity has brought about a global coexistence between people and people, between people and machines, and between machines and machines. 2. Which technology do you think has made the biggest contribution to our ‘humanness’ (based on your understanding/conceptualisation of humanness)? Hyperconnectivity has made a revolution in humanness by breaking down the boundaries of both time and space. Humans, animals, the environment, and gadgets are brought together anywhere and at anytime. The impact on society is enormous and we are only beginning to see the resulting massive changes in humanity. Hyperconnectivity has increasing led to less importance to physical place, such as developed or developing world, or urban or rural distinctions. 3. What do you think is the missing piece that will complete the technology puzzle? What kind of technology will be most needed in our future? Currently it is difficult to reproduce a true sense of presence through the internet. In traditional human communications, body gestures, the physical environment, and touch can often more deeply explain the intended mind and provide intrinsic information, which makes for a more rich communication exchange. Furthermore, we often communicate emotionally using all the senses simultaneously, including sight, touch, sound, but also through taste and smell, such as sharing a meal together or cooking for a partner. We thus need to create fundamentally new forms of media to connect humans in the physical world and through the virtual world, not just in the transmission of information and verbal communication, but through meaning and nonverbal communication to increase the sense of telexistence using all the senses. This will allow more opportunities for people to make meaningful exchanges using media in both the physical and virtual world. 4. How do you feel about speaking at SDF2012? What are your expectations? The program is exciting and highly relevant and addressing important issues for our present and future, with the input of world experts. I expect this to be produce new changes in both industry, government and academia. 5. What/who do you want to see/meet the most in Seoul (or among the speakers of SDF2012 – please refer to the attached speaker line-up)? I am looking forward to meet many leading visionaries and I also hope to have discussions with passionate general attendees especially young people. 6. What kinds of technologies realize the ‘reality-virtuality coexistence’ in our daily life? The world has become hyperconnected. The Internet and web application are are available instantly and anywhere. People and the environment can communicate with each other instantly. Combined with almost unlimited data on the cloud and social media we are seeing a process of hyperconnectivity which effectively merges the physical reality with digital data. 7. Where is this zeitgeist heading and how will they shape our future? The hyperconnected world will extend to encompass more of our senses and feelings. This feeling communication will extend beyond humans into the physical environment, gadgets, and machines. In the ubiquitous environment that our world is developing into, there is great potential for our homes, cars, personal devices, gadgets, and workspace, to communicate with us in all of our human senses, and in non verbal and emotional forms. We could envision social networks extending beyond humans to an emotional communication between humans, their environment, and their personal objects. 8. How to make AR/MR become more humanized and thus sustainable? Physical presence takes a major role and it should dive into a new dimension of cutting edge technologies offering improvements to ordinary day-to-day feelings and experiences. I aim to develop new technologies related to multimodal sensing and actuation to give the user more definition in their experience in the co-space environment. Visual, Auditory, Haptic, (Olfactory) Smell, and (Gustatory) Taste are the five sensors that humans use for environmental sensing, and emotional feeling communication. In addition to traditional communication through telephone and video-conferencing, the use of smell, and taste communication will enable a new paradigm of tele-communication. It is a field, which still presents great technical challenges which can lead to early technical breakthrough results. Based on these inventions, I believe such a multisensory telecommunication will allow new forms of collaboration and learning on a global scale. I am particularly interested in how children will grasp these technologies to make new innovation and value creation. I am thus in in the process of examining how to nurture and inspire young children to create new value propositions that will benefit their individual selves, communities and countries. In the 21st century the democratization of communication tools may allow emerging markets to make creative leaps into new business and industry. We can view young children in developing countries as creative innovators and ambassadors of new technologies, rather than passive end-users consumers. Thus in this aim, I am creating design applications and workshops with the use of new media technologies for children in local schools. The realm of human influence is extending its scope and reach. The new generation of mixed reality technologies is merging the real and the virtual, making possible simultaneous interactions between the two worlds. With its limitations in interface design and accessibility being mitigated, mixed reality is making tangible contributions to expanding human potentials in an increasing number of practical fields including healthcare, education, training and media by lowering spatio-temporal barriers. With the real and the virtual coming to coexist and increasingly interfused, what kinds of benefits and obstacles lie in store for us? The advent of new technologies has profound ramifications for the way we think and behave. What, then, is this digital world and its hyper-connectedness for, and where is it headed? Captivated by such terms as openness, collaboration and a new ecosystem, the narratives of ―coexistence‖ are defining a new zeitgeist and a key formula for survival in the digital era. Information technology is gearing toward enabling a better life by aiming for broader inclusion and bringing together more diverse voices; now more than ever, the world is in an earnest quest for technologies that are not just smarter, but more humane and compassionate. Amid these currents, how can we forge a world where technologies become more humanized, real and virtual worlds more naturally merge together, the values of the analog era are still preserved, and humanistic digital technologies help narrow the various gaps between groups and generations? What has so far typically grabbed the limelight has been any newly developed technology and the people in the vanguard of that technological advancement. We have been pouring too much of our energy into keeping apace with rapid changes while unwittingly or tacitly postponing in-depth discussions on technology-induced challenges. It‘s high time that we turned our long-overdue attention to the direction in which technology is headed, and the values it brings to our world. It is the appropriate time to put the technologies around us under close scrutiny and measure their impact, drawing on the framework of Oriental humanism that interweaves science, religion and ethics as well as aesthetics. What new wonders of technology are before us and how will they shape our future? What is the nature of the Big Data society and how can we make the most out of it? What are the potential pitfalls, and what is the future of data privacy? Is it possible to make appropriate technology (AT) sustainable? What roles can such technologies as speech recognition and interface design play in making technology more people-friendly? Is SNS a facilitator of online democracy or of mob rule? What types of data should be shared and open, and how much? Copyright or copyleft: which way to go? How can we forge a new ecosystem for both corporations and consumers? How do different technologies foster or threaten the emerging era of coexistence? I had the pleasure of being invited invited to Malaysia by the Malaysian government investment arm and part of the visit was attending the Malaysian F1 Grand Prix. 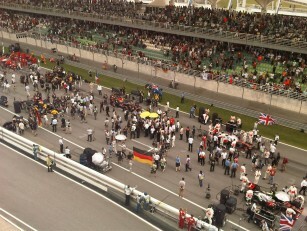 At the F1 I met Malaysia’s modern founder and Prime Minister for many years, Dr. Mahathir Mohamad. I found Dr. Mahathir to be a most pleasant and gentle man. I could feel he had a deep and solid thinking. I was introduced to Dr. Mahathir as the person who “invented chicken hugging on the internet” (related to my previous work Poultry Internet). Dr Dr. Mahathir actually asked me about poultry internet, and I was happy to explain. I guess it was the first and maybe the only time he would talk about internet chicken hugging. As I watched the F1 it actually came to my mind that Dr. Mahathir basically made all this happen, he modernized the whole country. But I am also very impressed that he let the country go into basically full democracy. Malaysia reformed into an open democracy with the people free to express their voices. 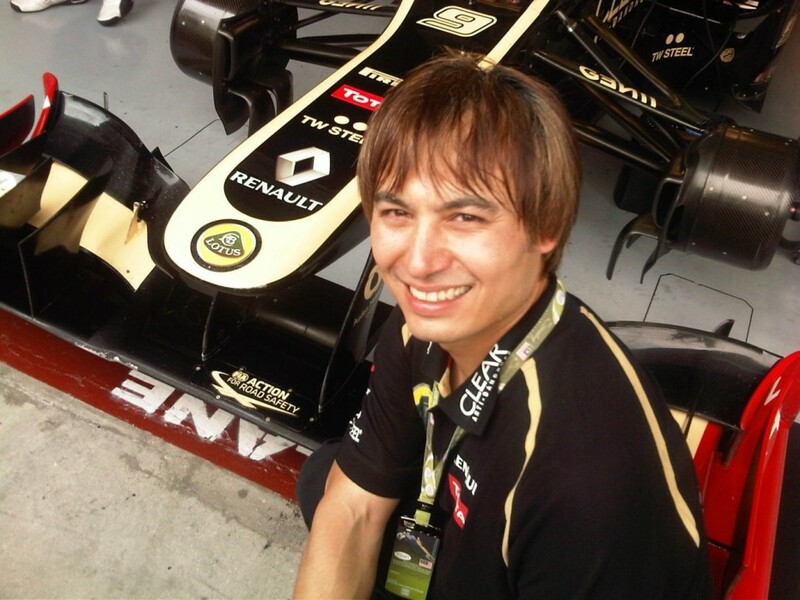 I had the pleasure to enjoy the F1 in Malaysia close up, but what I left with was a more deep impression, I felt free to be myself in Malaysia, it is a open and free society. What’s an Ignite talk? Five minutes on stage to talk about an idea, an interest or a passion. You get 20 slides that rotate automatically after 15 seconds. It’s fun, it’s fast, and the format forces you to really think about what you want to say. We are pleased to announce that our second Stream Asia event will take place 8 – 11 March, 2012, in Phuket, Thailand. Hosted by Sir Martin Sorrell, CEO of WPP, and Yossi Vardi, internet investor and founder of Kinnernet, Stream Asia will bring together around 300 top creatives, entrepreneurs, investors and corporate leaders who come together to learn from, and contribute to, the freshest thinking on the future of technology and communications.Click here to see the current attendee list. The format of the event follows the ‘un-conference’ model with limited keynote speeches and PowerPoint presentations; instead participants are invited to take part in discussions on the latest industry topics in communications and technology. Click here to see a list of previous discussions. Attendance is by invitation only. For more information on Stream Asia please email The Stream Team. I flew from Narita airport on Thursday, and arrived a little bit late in the night time. But luckily I was in time for the Gadgethon. As I am more used to technical conferences, I thought that this would be a session of people showing their own demos. However it was mainly showing the latest and coolest gadgets that people have found. A kind of “hot topics”. The coolest think I thought was not anything digital at all, it was purely analog. It was a very cool, geeky, and kind of secret agent type jacket where it has hidden pockets for putting all your gadgets in, even iPad (http://www.scottevest.com/). The cool thing is when you are travelling, it is basically like having another carry on bag which you wear. I am sure the FAA will count these as baggage if many people start wearing them, but for now it is a very cool air travel hack. Thanks to Gary Shainberg (@garyshainberg) for showing this. The next day was the start of the discussions. There were about 8 discussions sessions at any one time, so it was difficult to know what to attend, as almost all of them looked very interesting. One of my favorite sessions was about social media and revolution 2.0 which was chaired by Thomas Crampton (@thomascrampton). However the greatest highlight was in having impromptu and serendipitous discussions with the amazing people attending the event, and also some of my favorite people who were also attending. One of my serindipitous moments was that I happened to bring a book along with me to read on the plane which was a gift to me from Gino Yu (@phusikoi) more than 5 years ago, which I never had time to read before. I was reading the book on the plane and thinking of Gino. Gino coincidentally happened to be one of the first persons I bumped into at Stream. After many years we had a long and deep discussion together. Another highlight was happening to sit together with all the Ogilvy & Mather people at the dinner. It was one of those lucky chances that serendipitously happen in life. If I knew the table was all Ogilvy & Mather people I might have chosen to sit somewhere else, in case I was interrupting or bothering some company discussion. As it was, I sat together, and we had amazing discussions and I realized they were very interested in smell and taste media themselves! Another serendipitous moment came very late in the night at about 3am. I was in the lobby area doing late night computing, and started chatting to Olivia Choong ‏ (@oliviachoong) and Judith Clegg (@judithclegg). Olivia was from Singapore, but I felt she was quite a radical and rebel person, which I really liked. I found she was really interested in Poultry Internet also. We talked about some internet business ideas, and even meditation. Judith is Founder & CEO of innovation agency Takeout. Founder and The Glasshouse network a 100 million dollar early stage investment fund. She had so many wise thoughts and insights and I discussed with her some internet business ideas. The next day I was able to have lunch with her and talk get a lot of great advice from her. That is the great thing about Stream, being able to learn from many wise and talented people such as Judith. The next day was also full of great discussions followed by a final dinner and party. I had to catch a bus at 7am on Sunday morning to the airport, but I realized I was still chatting to people, as well as dancing Michael Jackson together (there was an Xbox set up with the Michael Jackson dancing game). I only had time to shower, pack, and get on the bus before catching my flight. Thank you to Ella Weston ‏(@ellaweston) Director of WPP Stream and all the organizers of Stream for a fantastic and amazing event. The first revealed is Adrian David Cheok, Professor at Keio University, Graduate School of Media Design, in Tokyo Japan, as well as a Young Global Leader at World Economic Forum. 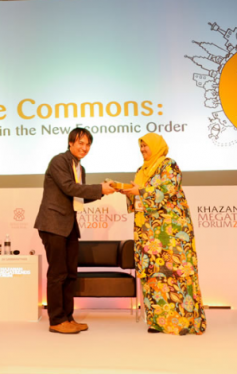 The Khazanah Megatrends Forum theme of “Reclaiming the Commons: Collaborating and Competing in the New Economic Order” reflects the interpretation of the times we live in today and aims to release a wealth of discussion on a variety of issues affecting the investment community.